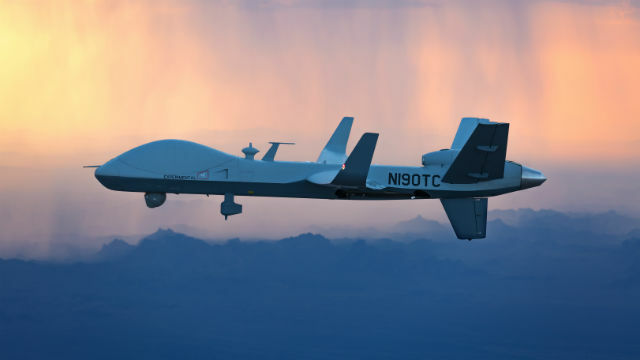 General Atomics plans to fly one of its Predator-series drones across the Atlantic Ocean next month to demonstrate its range and celebrate the centennial of the Royal Air Force. The MQ-9B SkyGuardian is scheduled to fly from Grand Forks, ND, over July 10 and 11 and land at an RAF base in Gloucestershire in the United Kingdom. The aircraft will then be on static display July 13 to 15 for the Royal International Air Tattoo airshow. It will be the first trans-Atlantic flight for an aircraft in the iconic Predator series. The MQ-9 version recently set an endurance record of 48 hours of continuous flight. During the long flight, ground controllers will communicate with the aircraft via the Inmarsat network. The drones are built in Poway by General Atomics’ Aeronautical Systems division.